The Netzaberg chapel and its 115-foot tower overlooking the village is the community’s brand new landmark. The wave-like facade and interior curved design elements reflect the chapel’s Upper Palatinate surroundings. Chaplain (Col.) James Watson, Installation Management Command – Europe; Col. Lance C. Varney, Commander, U.S. Army Garrison Bavaria, Auxiliary Bishop, the Archdiocese for the Military Services F. Richard Spencer; Chaplain (Col. Kevin M. Pies; Regensburg Bishop Dr. Rudolf Voderholzer; Brigadier General Antonio Aguto, Commander, 7th Army Training Command and Col. Matthew R. Tyler, Commander, U.S. Army Corps of Engineers-Europe cut the ribbon, officially opening the new facility. 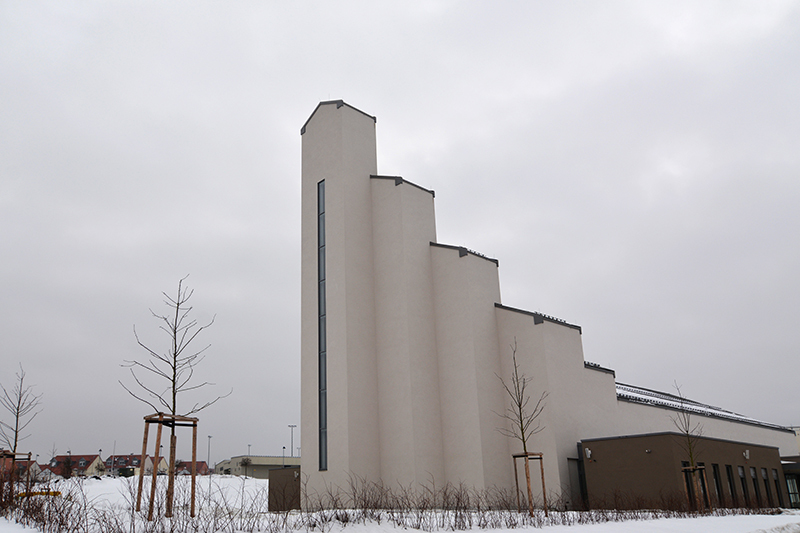 The Netzaberg chapel and its 115-foot tower overlooking the village is the community’s brand new landmark. The wave-like facade and interior curved design elements reflect the chapel’s Upper Palatinate surroundings. GRAFENWOEHR, Germany — The Netzaberg chapel and its 115-foot tower overlooking the village is the community’s brand new landmark. The wave-like facade and interior curved design elements reflect the chapel’s Upper Palatinate surroundings. Many U.S. and German military officials, religious and community members and local leaders attended the official dedication ceremony here Feb. 3, 2017. 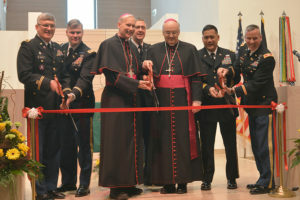 Auxiliary Bishop for the Archdiocese for Military Services Richard Spencer, Regensburg Bishop Dr. Rudolf Voderholzer, USAG Bavaria Chaplain Col. Kevin Pies and Installation Management Command Europe Chaplain Col. James Watson were among the dignitaries at the dedication. Commander of the 7th Army Training Command Gen. Antonio Aguto, USAG Bavaria Garrison Commander Col. Lance Varney and Commander of the U.S. Army Corps of Engineers Europe Col. Mathew R. Tyler were also present to support the ceremony. The new chapel, which replaces the aged one located on Tower Barracks, is scheduled to begin offering worship services in March, said Chaplain Pies. While the old Grafenwoehr chapel holds about 180 people, the Netzaberg chapel’s main room accommodates nearly 600 people. The space can also be divided into two rooms. Additional classrooms and child care rooms are also available. The $16.5 million project is the new home for many denominations. Plus, new features will accommodate more people and services. Varney also espoused the chapel as a space of spiritual readiness. Pies thanked everybody involved in the construction of the symbolic structure. “This is the BMW of the churches,” Pies said. U.S. Army Europe Woodwind Quartet and Mr. Benno Engelhart and his ensemble performed at the dedication ceremony.